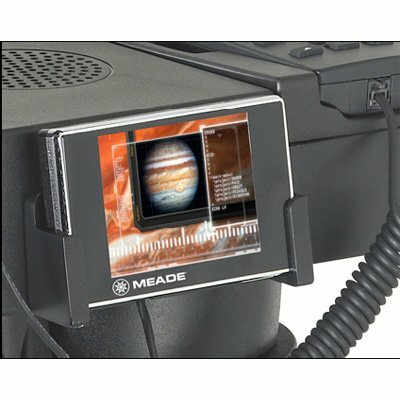 The Meade 3.5 inch LCD display monitor will enhance the use of any Meade telescope with Astronomer Inside™ technology by allowing the user to view the informative video presentations built into the telescope. With the display monitor connected to the telescope, you can learn the secrets and details of the objects you observe while you are viewing them. The Astronomer Inside will tell you about the planets, stars, constellations, clusters, nebulae, galaxies and more in a fun and interesting way. With the Meade 3.5 inch display, you will explorer the universe in a way you never have before. Designed to mount seamlessly to the LS telescope, the mounting bracket is easy to attach and sturdy. Durable nylon battery pack holds the dedicated eight (8) AA battery pack. Access flap secures with positive hook and loop fastener. Integrated strap slips over the telescope base for convenient, out-of-the-way mounting. Battery pack will power Monitor up to 20 hours of usage. Use the night vision feature of your LS telescope to display the multimedia presentations without affecting your dark-adapted eyes.